Now, this is the way to eat chicken breasts. 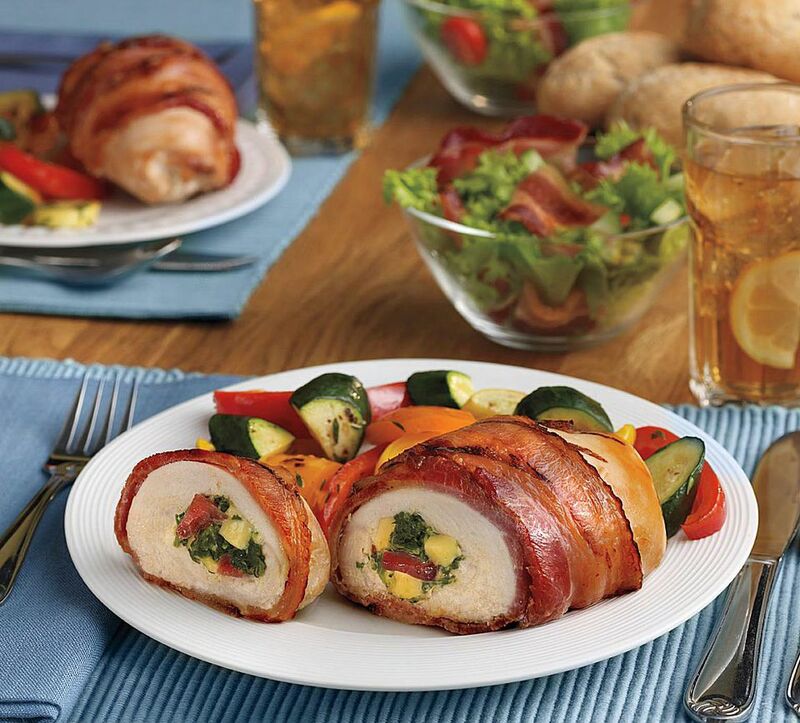 Stuffed with Gouda cheese, bacon and then grilled, this chicken roulade is simply delicious. Spray cool grill grate with cooking spray and preheat grill to medium-high. While grill is preheating, cook 6 strips of Wright® Brand Hickory Bacon according to package directions. Allow to cool slightly, then coarsely chop and set aside. Place the spinach and chipotle pepper in a large bowl and mix thoroughly; gently fold in the Gouda cheese cubes and cooked bacon pieces to incorporate. Lay each chicken breast on a piece of plastic wrap and pound until flattened. Place 1/4 cup of the filling on one side of each chicken breast, roll up chicken and tuck in filling. Wrap each chicken roulade with two pieces of uncooked Wright® Brand Hickory Bacon from end to end and secure with toothpicks. Place chicken on​ the medium-hot grill and cook with lid closed for 8 to 10 minutes, turning each piece at the halfway point. Continue to cook another 8 to 10 minutes with grill lid open until desired crispness is achieved. Roulade is cooked through once they reach an internal temperature of at least 165 F.
Transfer chicken roulades to a platter and let rest for 10 minutes. Remove toothpicks, slice, serve and enjoy!